Looking for the new professional vaporizer of the future? The Firefly Vaporizer could easily be the solution to all of your vaporizing needs. This new dry herb unit utilizes an advanced convection heating method to allow for a smooth and satisfying vaporizing experience. The convection heating method, opposed to conduction produces a higher quality vapor by pre-heating the air before it passes through the herb. This makes vaporization extremely clean and efficient. I had heard a lot about this handheld vaporizer as it was getting a lot of buzz in mainstream portable vaporizer reviews I had read this year; once I got it in my hands and took a rip, I knew what all the fuss was about. However I also realized that this thing is way heavier than I would have expected. Like the Arizer Solo, the Firefly is a little heavy and bulky, making it a less than ideal pocket vape. Still, if you whip this bad boy out of your lapel at a cocktail party, we’re pretty sure you’ll be the envy of your jet set. 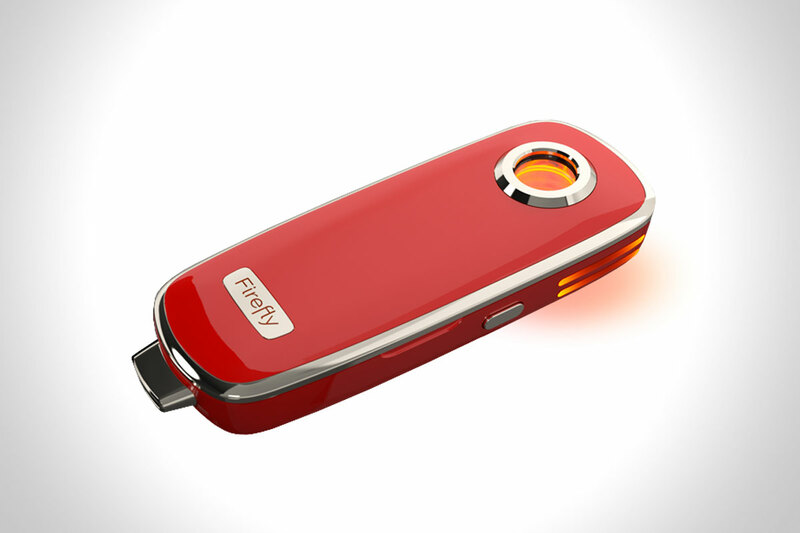 Not only is Firefly’s design sleek and modern, but it’s discreet enough to use on-the-go at your own convenience. The magnetic, removable face-plate calls for less time spent refilling of the herb chamber and more time vaping. The convenient glass viewing slot allows you to know exactly when it’s time to empty and refill the herb chamber. All of the components are made with expert engineering and no expense was spared to make this a personal vaporizer for the professional connoisseur. 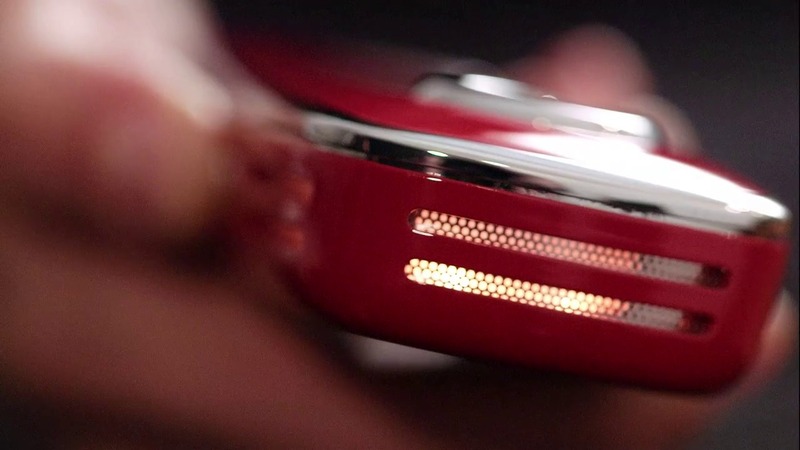 For example, Firefly’s heating element is made of an American-made, FDA-Foodsafe super-alloy. This allows the heating element to withstand repetitive heat cycles without breaking down. The replaceable, long-lasting Lithium Ion Battery requires only about 45-60 minutes to fully charge and should easily last the course of a day, if using intermittently. Unlike most other portable vaporizers, the Firefly battery can be replaced in a matter of seconds, so feel free to get a spare, as well as a power source, and vape any time you wish. 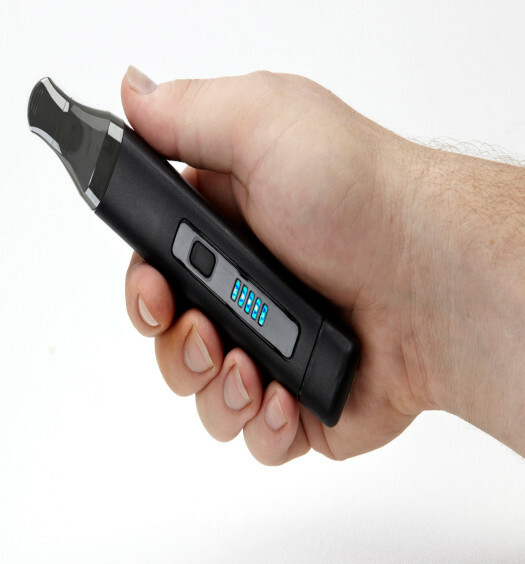 Firefly also heats up impressively quick; practically instantaneously since it is breath-activated, making vaporizing on-the-move extremely easy and convenient for your everyday use. On top of being a fast-heating device, Firefly also has a precise, computer-controlled heating element, which allows the unit to only reach a maximum temperature of 400°F (200°C). This will surely assist in avoiding combustion and releasing any harmful carcinogens into your lungs. On the whole, I enjoyed the simplicity, design and construction of the Firefly Vaporizer; they come in three different colors which is a nice little gimmick lots of vapes are employing these days. The taste of the vapor was tremendous; however I felt that the amount of vapor production was comparable to other handheld vaporizers of similar and lesser price. If you are a discerning vapor enthusiast, this is the professional portable vaporizer for you. We recommend purchasing the Firefly directly from the manufacturer’s website. Looking for the new professional vaporizer of the future? 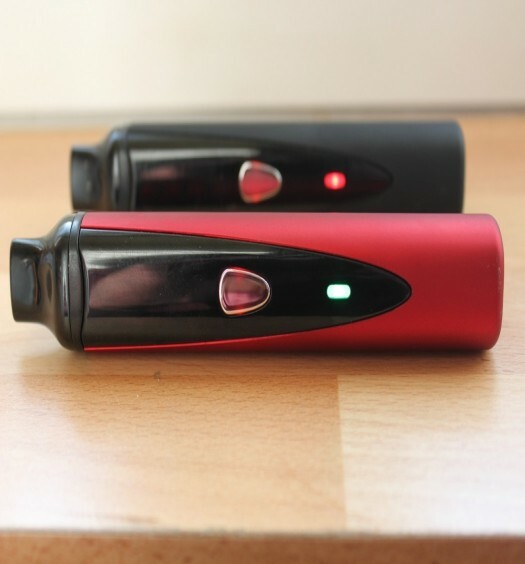 The Firefly Vaporizer could easily be the solution to all of your vaporizing needs. This new dry herb unit utilizes an advanced convection heating method to allow for a smooth and satisfying vaporizing experience. Concept is great no maintance. The problem is IT DOESN’T WORK. I will explaine why, the mouthpiece doesn’t seal off and falls out all the time. Hard to draw must draw for a long period of time. When vaporizing just starts the unit shuts off from overheating. Batteries drain extremely fast. You have a seven day warranty on an unused unopened product how do you know if it will work if you can’t use it. After that they will try to help you, but you have already tried everything they tell you. After reading all the reviews of the Firefly, I decided this would be the best vaporizer (needed for health reasons) even with the price. I have not had a Firefly for an entire year, in fact, this will be my 3rd one in a little under 11 months, all of them have died, the “firefly” quits completely. Battery says its fully charged, so I thought differently and changed it, new battery still didn’t fix it. Each one I have had to recharge after 1 chamber. I can say who I bought it from they have been great with customer service, I am just getting tired of it working for a month or maybe 2 then dying and am extremely disappointed as each one that I send back I have to wait about 4-5 weeks for a new one (if they can’t fix my old one). Lots of money for little use. The Firefly vaporizer I received was defective – it could not be used for more than 10 minutes without recharging – so I phoned Firefly tech support. I was told not to worry: the unit is under warranty for a year and I could send it back for repair at any time within that period, but I was NOT told that the battery is only warranted for 30 days. When I sent the unit back later in the year, Firefly determined that the battery was defective but they informed me that I would have to pay for a new battery. If I had been told when I phoned shortly after purchasing the unit that the problem might be the battery and I should send the unit back immediately, I would have done that, but I was not given correct information by Firefly support, so I did not return the unit immediately. Although the fault lies with Firefly support for failing to give me accurate information, I must now pay for a new battery. Lousy product, terrible support, insensitive customer service!